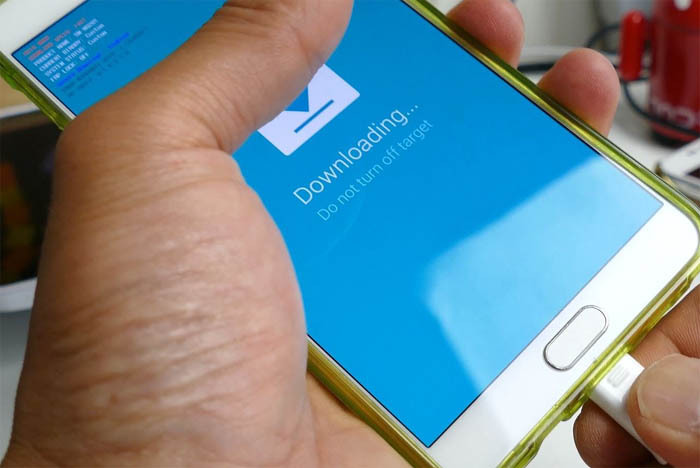 What to do if your Samsung #Galaxy Note 5 (#Galaxy #Note5) got updated to #Marshmallow but can’t recognize your fingerprints and PIN after the update. Learn how to deal with your phone that doesn’t seem to find new firmware updates. Read about the issue of one of our readers who used to send emails with attached pictures amounting to almost 20MB but can no longer do so. What if you downgraded your Note 5 from Marshmallow to Lollipop but the phone got stuck in boot loop? An owner complained about a problem with her phone that just got updated to Marshmallow but can no longer have a solid connection when in calls via Viber, Tango and WhatsApp. What you should do if your phone sees an update but can’t pull it down for installation. Everybody expects that firmware updates are supposed to fix problems but we received a not of complaints from Samsung Galaxy Note 5 owners because Marshmallow seemed to have brought more problems than fix existing ones. Firmware issues are often very complicated to deal with and there are cases when phones got bricked due to issues brought by these updates. In this post, I will try to tackle some of the problems we received from our readers. Continue reading below to know more about these firmware problems and how to fix or troubleshoot them. If you’ve already contacted us before, try to see if your concern is among the ones I addressed. For those who have other concerns, make sure you visit our Note 5 troubleshooting page and browse for issues that are similar or related to yours. You may then use the solutions or troubleshooting procedures we suggested. If you still need further assistance, you can always contact us by completing our Android issues questionnaire. Please provide us with necessary information about your problem so we can provide more accurate answers. A: I don’t want to give you false hopes here. So, as early as now, you should know that you can’t bypass the fingerprint lock if the phone won’t recognize your prints nor your PIN…unless you reset it. That’s how security works for this device. Turn off your Galaxy Note 5. If this doesn’t work, then there’s only one thing left to do so you can regain access to your phone, although you really have to make some compromises. A: Firmware updates are rolled out by region and for units that are carried by a provider, the update is channeled through its respective carriers. Samsung has long rolled up the Marshmallow update for the Note 5 so it could be that your provider is the one preventing it from reaching your phone. It’s better you call them about it as they can give you more accurate answers. A: You left us hanging here. You should have told us what email service you’re using so we can provide more accurate answer to your questions. Well, anyway, if you’re using Gmail, Yahoo, AOL (and mostly any free email service), the attachment limit is often 25MB. However, such limit may not apply if you’re using a corporate email. In this case, you need to contact your company’s IT personnel and ask for their help. Another factor that may lead to this problem is the stability and speed of your internet connection. When your connection is not that stable or fast, the uploading and sending processes may take too long that the system decides to just drop it. So, verify that your connection is good, stable and fast. You may restart your router or modem. I understand the convenience of attaching multiple files to one email but I think, just to work around this issue, it would be helpful if you just attach a picture or two to one email message until you finish sending them all. It’s your call. A: If you’re savvy enough to manually flash an old firmware to your phone, then you must have known that there are risks involved however easy the process may seem. You should have at least tried to back up your data before anything else. Now that you encountered a problem, you contact us in hopes that we know something that could get your phone out of boot loop. We modders all know that sometimes a reset is necessary to make the new firmware (well, in your case, old firmware), work. We don’t know if you did something wrong but please verify if you got the correct firmware for phone’s model. Also, make sure the flashing process isn’t interrupted. Contact Samsung and ask tech support why you’re not getting any firmware update. Try resetting your phone (instructions below) and after that, search for updates to see if the phone can upgrade its firmware. Download the firmware and use Odin to manually flash it on your phone. Turn off mobile data and make sure your phone is connected to Wi-Fi and try making calls through the apps you mentioned. The Note 5 has the smart network switch feature that allows it to connect to mobile data if it senses Wi-Fi is weaker and vice versa. The thing is, when it happens, the phone loses connection instead of making it better. That might be the reason why your calls won’t connect or get disconnected. Do the same thing for mobile data. Turn off the Wi-Fi switch and make sure your phone is connected to your provider’s mobile data network and try to make calls. About the new software update, well, install it. It won’t go away unless you downloaded and installed it on your phone. As the error, we just can’t provide you a solution simply because we don’t know what the error is all about. Secure a computer you can use that has an active internet connection. Go to Samsung’s website and download Smart Switch. Connect your phone to your computer and launch Smart Switch. Hit the Update button and you’ll be good. After downgrading android 7 to 6.1 . My galaxy note 5 is not working . Just restart automatically and noting is appear.